Our Sunshine turns 11 tommorow but we celebrated her birthday this weekend with two different parties, a party for friends on Friday Night and a party for family on Saturday afternoon. It was a lot of work to host these two parties and we are wore out but it was so worth it in the end. 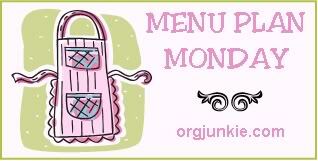 I incorporated a lot of handmade items into the party so I started working on some of the items a couple of weeks ago. Also, I did these parties on a budget and managed to do both parties for just $53 out of pocket, inluding food. I managed to keep it to this price due to the fact that I used a lot of what I had on hand. 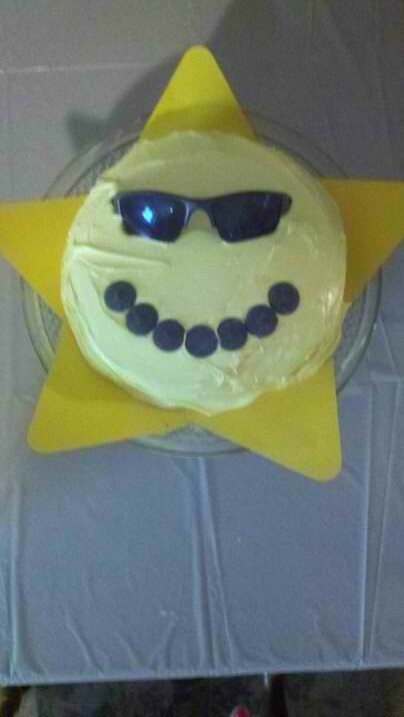 Sunshine told us a couple of months ago that she wanted a sunshine cake for her birthday. So that is what she got. So from the beginning we knew whatever theme we chose for her party we would need to build it around the sun cake.﻿ I knew I had some leftover decorations from my son's luau party the year before last. This included a box of leis, a box of parasoils, two table cloths, some palm tree centerpieces, a couple of packs of napkins, and a couple of packs of plates. Enough to cover another party for sure, and the best part is that I wouldn't have to spend any money out of pocket for these items (which by the way were on clearance when I bought them). 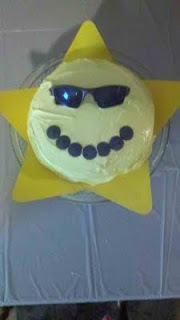 The Luau theme would work great with the Sunshine cake so there we had it - a Luau party! In addition to the cake I knew I wanted to have cupcakes for the birthday party for her friends, just because they are easier to manage with kids than a cake. 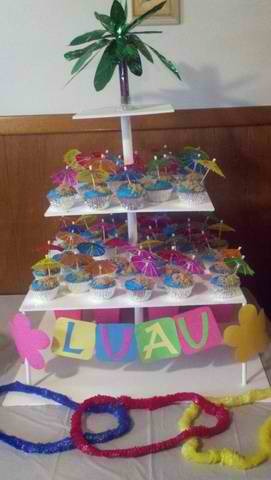 I googled "luau cupcakes" and browsed through the image results. I found several variations of a sandy beach cupcake that I liked and decided to make. I had no idea how to display all of the cupcakes I would need and had been looking at cupcake stands in the stores. I find it ridiculous to pay $8 for a cardboard, character themed cupcake stand you will throw away and refuse to pay $40 for a nicer stand that only holds about a dozen or so cupcakes. So my hubby helped me to make this cupcake stand. It was made for under $20. I will be posting a tutorial this week of how it was made. Another decoration that I made myself were these tissue paper pom-poms. Some turned out better than others but they were incredibly easy to make. 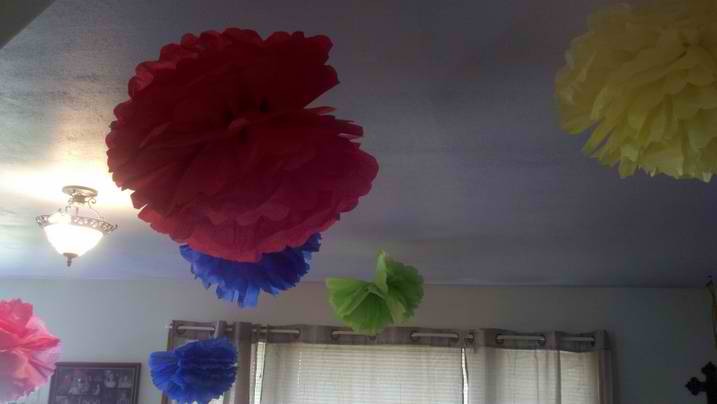 I spent $4 on tissue paper and was able to make 15 of these with that tissue paper. 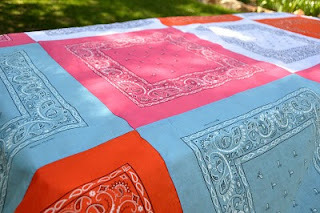 I used this tutorial from Martha Stewart to make these. After the party we hung a few of these in the girls room since the colors matched. The others I folded up and put in a box to try to use again later. I had some red and green chocolate melts leftover from Christmas that I used to make these flower suckers for the goody bags. This was one of those items that didn't cost anything since I used items that I already had at home. The table is set ready to party! See the yellow flowers in the middle of the leis? Those are the hair barettes that I made for the girls to wear during the party and they were able to take them home as party favors. I spent $2 on flowers from the Dollar Tree, and $1 on hair barrettes. I was able to make twelve with these supplies so they averaged out to a cost of $0.25 each. We played several games, and music for the games was provided by a Kid's Luau CD that I found at Party City for $2.50. Obviously we played limbo (what luau would be complete without a game of limbo? ), as well as Musical Beach Towels, Pass the Beach Ball, and Luau Bingo. I wasn't sure how well the games would go over because I wasn't sure if the girls would think they were "too big" for them or not. They actually all had a blast playing them, and all commented on how much fun they were. Musical Beach Towels is the same thing as Musical Chairs only we used beach towels instead of chairs. Pass The Beach Ball is just basically the same thing as Hot Potato. The girls passed the beach ball around the circle, and whoever was the last one to touch the ball when the music stopped was out. The game continued until only one person remained. I printed out these Luau Bingo Cards from Fantasy Jr. Since there are four free spaces we required the girls to have two full lines before yelling Bingo. I cut up pieces of scrapbook paper to use as markers for the cards. For prizes for the game winners I bought card games from the Dollar Tree. The card games came in packs of 3, so I bought 3 packs for a total of 9 prizes for $3. The card games included Old Maid, Crazy Eights, Go Fish, Rummy, and Hearts. For drinks I made a pitcher of Pink Lemonade and a pitcher of Strawberry Lemonade flavored Kool-Aid. I had the Kool-Aid on hand so no cost for the drinks. For cups I found plastic water bottles (which were BPA free) on clearance for $0.30 each. I had planned to paint each girls names on the water bottles but decided against it. I bought all of the girls pink water bottles, so to tell them apart I cut out 4" flower cutouts using my Cricut. I had the girls write their name on the flowers using a sharpie marker, and then attached them to the cups using packaging tape. They took their water bottles home as another party favor as well. I used my Cricut and some scrapbook paper I had on hand to make a Luau sign for the cupcake stand, and a Happy Birthday banner. 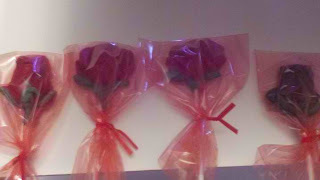 I used materials I already had on hand to make these so they were another no cost decoration. If you look real close at the above picture you can see the goody boxes we made the girls on the bottom shelf of the cupcake stand behind the Luau sign. The goody boxes were bought on clearance at Wal-Mart. They were in a pack of 8 for $1. The goody boxes were filled with Luau themed silly bands found on clearance for $0.39 (which I bought 3 packs of and split between the boxes), 2 necklaces each which were bought in two packs of 10 for $0.49 each, the chocolate suckers, and candy that was bought at the Dollar Tree costing $3. I'm hoping it all comes out well. Thanks for the decorating ideas!! !